Paul Henderson's last-minute goal in Game 8 gave Canada a victory in the Summit Series, triggering a celebration the likes of which the country had never seen. But nearly lost in all the hoopla was the fact the best players in the National Hockey League had to rally to beat a team that, only a month earlier, it had been expected to sweep. 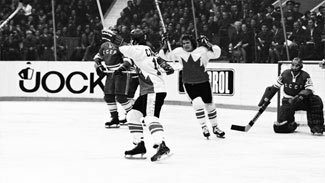 The reaction to Canada's win in the Summit Series illustrates just how much the world has changed in the past 40 years. Though there were 3,000 Canadian fans in Moscow and national TV coverage throughout the country, the members of the Canadian team were largely cut off from how the series was being perceived at home -- and they weren't expecting the kind of reception they got. "I think it caught everybody by surprise," Bob Clarke told NHL.com of the greeting the Canadian team received after arriving home. "When we landed, there were thousands of people, the prime minister was there. I think we had in our minds an idea that it had an effect on Canada, but we had no idea how big that effect was and how long it would last -- pretty incredible, really." Rod Gilbert, who had a goal in Game 8, flew back to Canada with the team before heading to training camp with the New York Rangers. He said the reaction in the two countries couldn't have been more different. "We were heroes in Montreal and Toronto and throughout Canada," Gilbert told NHL.com. "But then I came to New York and the only guy who congratulated me was [ABC News anchorman] Peter Jennings. He told me that it was the most exciting event he'd ever seen -- forget sports. It had a little bit of everything. "But [the series] never gained any momentum in the United States. The only guy who publicized it was Jennings -- because he was Canadian." Even more incredible was the effect the series had on the sport. It's safe to say that hockey as we know it has never been the same. The NHL of the early 1970s was largely a straight-line, skate-your-lanes League. The players, with the exception of a handful of Americans, were all from Canada -- as were the people who ran it, even though 11 of the 14 franchises were based in the United States. Teams had one coach -- the idea of having a phalanx of assistants wasn't even a gleam in the eye of Fred Shero, who introduced the concept of help for the bench boss. Conditioning was nothing like it is today -- players came to camp to get into shape, rather than arriving in top condition. The overall pace of the game was slower. That's why the NHL stars who comprised the Canadian team were stunned when they faced the Soviet Union for the first time. Ostensibly, the Soviets were amateurs -- there was no professional hockey in the U.S.S.R. in those days -- but in reality, they were pros who spent 11 months a year playing hockey. Their conditioning left the Canadians gasping for air, and Henderson said their emphasis on being in top shape has made a huge difference in the sport. "The [Soviets] changed the game physically," Henderson told NHL.com. "We were never in the shape they were in. Their physical conditioning was unnerving compared with ours." So too, at least at the start, was the Soviets' style of play. The Soviets looped and criss-crossed; they refused to dump the puck into the zone if there was no play to be made, opting instead to control the puck and try again -- a forerunner of today's puck-possession style of play. They rarely, if ever, took slap shots, opting for wristers and backhanders -- and for trying to make the perfect play. The Soviets would hit when they had to, but they would rather skate around opponents than through them -- a 180-degree difference from most of the NHL at that time. It was a stunning change. "It revolutionized hockey," Hall of Fame member Rod Gilbert told NHL.com. "Fred Shero [then a coach in the New York Rangers' minor-league system, later the coach of the Philadelphia Flyers] started to go there, and a lot of the scouts would go to see their patterns." "Look at hockey today -- they're playing like the Russians in the old days. They're all changing wings and forechecking differently. It really improved hockey, that series." Bob Clarke, the epitome of grit during his Hall of Fame career with the Flyers, said one legacy of the series has been the increase in skill among Canadian players. "I think that for quite a few years, the Canadian individual player has become more and more skilled," he told NHL.com. "The Soviets have always produced individually skilled players who stand out. For the size of their country, though, they're not overwhelming. The Canadians now are producing highly skilled players who have taken hockey to a new level -- more skill involved, less grind. "The game itself is played by so many highly skilled players now, and that makes it so much more fun to watch." Fast forward 40 years and it's easy to see the blend of the two styles. The dump-and-chase style of the NHL has been augmented with the quick passes and speed of the Soviets -- and in turn, the Russians (and other Europeans) play a much more physical style than they did four decades ago. "We're playing hockey like they did in the '70s [now] in Canada, and they're playing hockey like we did in the '70s here in Russia," Phil Esposito said during the recent visit to Russia by 14 members of the Canadian team. "It's good. It's really good." Ironically, Esposito -- the object of fans' hatred in Moscow 40 years ago -- is now a rock star in Russia; he was mobbed for autographs by fans during his visit. His daughter Carrie, who died earlier this year, married Russian-born Alexander Selivanov, who played for several seasons in the NHL before spending the past decade in Europe. That's just one example of how the Summit Series has internationalized hockey. Look at any NHL roster today and there are players from any number of countries -- including Russia, something that would have been unthinkable 40 years ago. 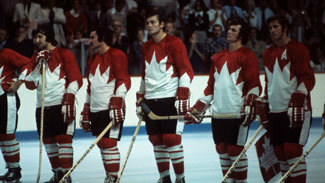 Even more notable is the legacy the Summit Series left in terms of international competition. Prior to the tournament, North Americans were focused on winning the Stanley Cup; Europeans viewed the Olympics and the world championships as more important. The Summit Series established common ground, leading to the Canada Cup, the World Cup of Hockey and other international competitions -- and ultimately to having professional players from all countries take part in the Olympics. Canada won the Summit Series 4-3-1 -- but 40 years later, there's no question that hockey was the big winner.